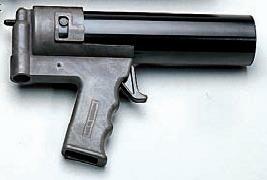 A heavy duty metal pneumatic cartridge gun with quick attach retainer and fast air exhaust shut-off to reduce drips. For 1/10 Gallon (310ml) cartridges or pre-filled sealant/ silicone cartridges. Undo the metal cartridge body retainer. Load in a filled 10oz size plastic cartridge. Replace the retainer and twist tightly to secure the cartridge.